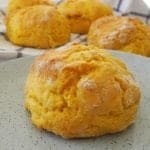 These easy Cheese and Pumpkin Scones recipe makes a great morning or afternoon tea treat. Both regular and Thermomix instructions included. Preheat your oven to 230 degrees celsius and line a baking tray with baking paper. Place the self raising flour, salt and nutmeg into a large bowl. Add the butter (which has been cut into cubes) and use your fingertips to rub it into mixture until it resembles breadcrumbs. Add the milk, sugar, grated parmesan cheese and mashed pumpkin and mix together with a butter knife. Turn the scone mixture onto a floured surface and knead lightly to bring it together into a dough. Use your hands to shape the scone mixture until it's approximately 3cm thick and dip your cutter into a little flour and cut out the scones. Bring excess dough back together and cut out more scones until all of the mixture has been used. Place the scones into the baking tray so that they are almost touching and use a pastry brush to brush a little milk over the top of them. Place the scones into your preheated oven and bake for 12 -15 minutes or until risen and golden.